Design and program your own ships! Drovoid is a game of building spaceships and programming them, sending your ships to colonize space through mining and space battles. Ship design is achieved by simple assembly of ship modules, through a drag-and-drop interface. Programming is done through a full blown - yet easy to learn - scripting language based on Lua. There is a large choice of modules (thrusters, guns, lasers, shield, armor, etc.). Drovoid provides pre-programmed AI modules defining three base ship classes: Fighter, Miner, Defender. 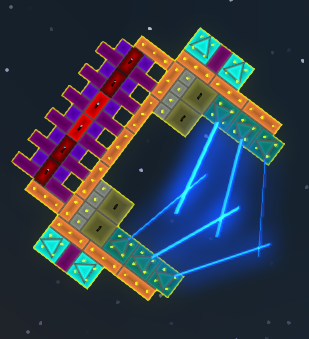 This lets you build very capable ships without any programming. If more control is needed, the Program module provides a fully scriptable interface that controls other modules through state variables. All other AIs are built with it! Drovoid can be played in solo or in multiplayer thanks to the included server. Automated battle ships can be uploaded to the Arena to compete! Drovoid is powered by A.S.T.R.E. the ASynchronous Task REschedueling operating system. This unique technology enables the simultaneous simulation of a large number of scripted ships on all CPU cores, while ensuring that no script is allowed to stall the system. Design spaceships through a simple drag and drop interface. Weapon systems: lasers, balsters, guns. Defense systems: passive armors, active shields. Manage power throughout your ships. Design with redundancies to avoid catastrophic ship failures. Automate your ships with scripting! Fight against computer-controlled or other player's ships! Send your automated battle ships in the arena! Save your ships for reuse across solo and multiplayer modes. Autosaves every minute, both solo and server. This level 2 mining ship will make you rich! The back of the ship is dedicated to power supply (power cells in red) for the heavy duty mining lasers and the four thrusters. The Ore is mined from the asteroids into the containers (in brown-green), and then processed by the refinery components (in gray). The purple components are the logic circuits, allowing better power management and manual ship control through the mouse and keyboard.